You are here: Home Forum Home Glasspar G3 Emblems and insignia for a 1960 G-3 Center Deck. Emblems and insignia for a 1960 G-3 Center Deck. TOPIC:	Emblems and insignia for a 1960 G-3 Center Deck. A friend of mine just picked up a nice CNC mill and I've asked him to see if he can replicate the only emblem that was on my G-3 when I got her. It was actually in the bilge. He whipped off a keychain for me and it's not bad for a scrap of aircraft aluminum. I'm hoping someone can steer me to some good photos or drawings of all the insignia that was on her from the factory. The one I have is too rough. This is the keychain. It weighs almost nothing. It's not much of a start but it's what I've got. Maybe he could make a side job out of this ? I have some pictures of the original "G-3 Starburst" Emblems off of our 1960 G-3 in my files. I will get them up here for you as soon as I can. For your information, this picture is exactly as it looked from the factory, with the black paint on the outer edge of the emblem and the gold colored paint around the "G-3" insignia. I have seen these emblems "custom painted" by G-3 owners in colors that match their individual boat colors too. Hope that helps you some Sir. That helps me greatly. I had no idea the real thing was so pretty !! On the back side of the emblem were there any setting pins ? It looks like something was attached there but is long gone. I wouldn't see the need for any but I'm curious. Were there any company name badges on the hull or interior when you got yours ? I thank you very much both now and in advance. Have a great day Sir. Glad to hear my picture of the "G-3 Starburst Emblem" helped you out Sir! To answer your question, NO, our "G-3 Starburst Emblem" did NOT have any type of "setting pins" on them. They are pretty smooth across the back. 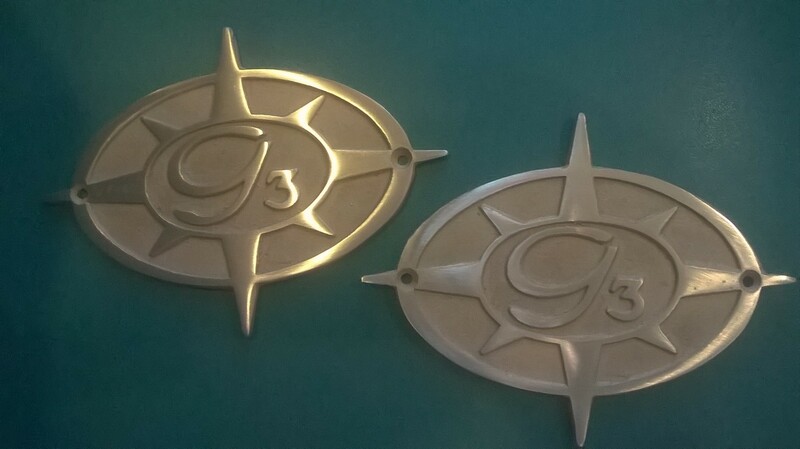 Our "G-3 Starburst Emblems" are attached with two (2) small screws in the side of the boat at the front of the sponsons. As to your other question, the only other "emblems" or markings on our 1960 G-3 was the larger "Glasspar" Metal Emblem that is displayed across the back support of the center deck. I will get a picture of that up for you as soon as I can too. For your information, the 1959 G-3's had a "Glasspar" Sticker on the back of each sponson. 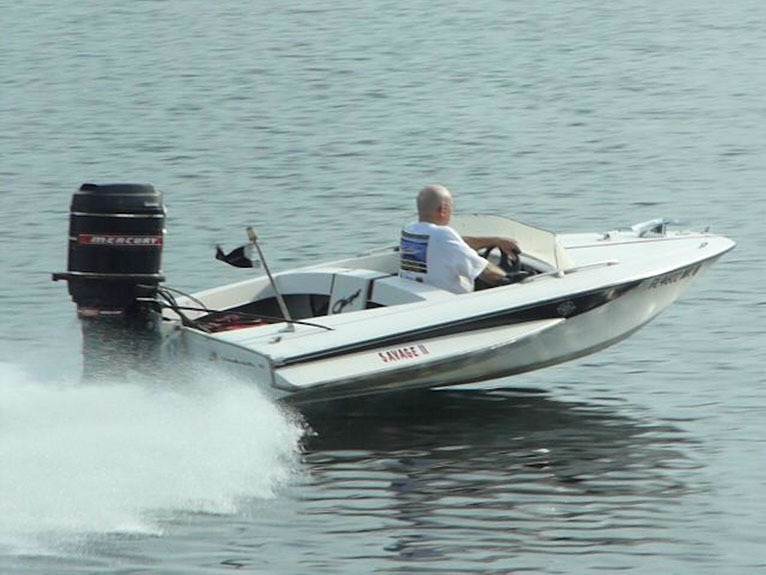 I have a supplier that can make those out here on the east coast if you are interested in doing your boat that way. For what it is worth, that "Glasspar" Emblem on the back of the center deck support do show up FOR SALE on "E-Bay" occasionally. The owners that sell them get some pretty hefty prices for them too! Thanks so much for your kind words on our 1960 G-3! As I have said here many times before, I give all the credit on the condition of our G-3 to my Dad. He NEVER let our G-3 sit out in the rain or in the water for more than the day or two we were actually using it. It was "garage kept" its entire life and I am a firm believer that doing that keeps these old classic boats in very good shape. 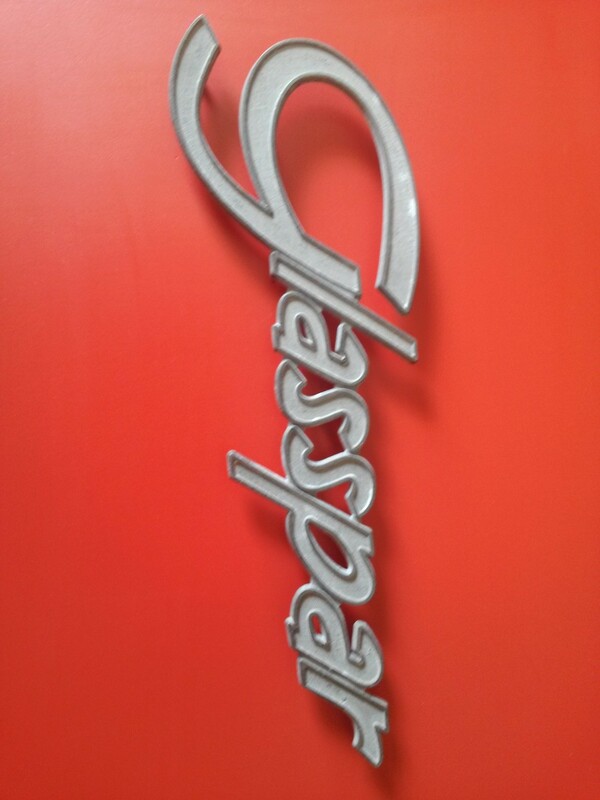 I will try to locate a picture of that original "Glasspar" Sponson sticker that came on the 1959 models. BTW,....what year is your G-3 Sir? It's one of the OTHER 3799 Center Deck G-3's produced in 1960 and is a hull with promise at this point. LOL. The stringers are gone and although the transom passes the knock test I still intend to reinforce it as I'll be hanging a big white Merc on there someday. It's been modified quite a bit and none of it for the better so it's going to be an all summer job next year to make it even close to right. There are so many great threads to guide me I've got no worries about screwing it up. I've seen a few boats with those decals on the top of the sponsons while surfing and if those decals aren't available I'll airbrush it free hand. It is a nice accent. If my G-3 comes out half as fine as yours I will have surpassed my wildest expectations. Thanks for all the help Sir an have a great night. Mark. She's not pretty but she's got decent bones. When I started washing her all the white paint started flying off and I discovered it's a cream colored hull ?!?! Some claim they didn't make them in that color but it's there much to my surprise. Is it factory ? Good question. Nothing that was done to this boat before now was done properly or well so I can't believe it's NOT the original gelcoat as it had been abandoned for some 30 or so years. I sent you a PM regarding these. I have to agree, Dean's boat is definitely top 3, but so is YOURS ! Between his Bandit and Dr. Frankenmercs Wild Thanggg (did I spell that right?) it's a tough call. As I figure I'll be needing advice from ALL of you when I get real with my G-3 I'm not going to make that call. P.S. Can anyone tell me if that is the correct trailer for this boat and who manufactured it ? After the boats is off the trailer I'm going to take it down to bare metal and start over from scratch with new everything going in. I have no faith in those runners and I had a bearing go south on me once on the QEW and almost lost my old Cadorette. No gambling this time around ! Again, thanks for your kind words on our 1960 G-3! We didn't have a whole lot to do on our G-3 due to the excellent job my Dad did in taking care of the boat and making my Brothers and I do the same thing! It does make a difference. It looks like your G-3 is going to take some work, but Dean Lofall proved it can be done on his 1959 as you saw. I was glad to see that Ken will be able to help you out with those "Glasspar" Sponson Logos. I think that Dean Lofall also found someone that can make them out where he lives in Washington State. 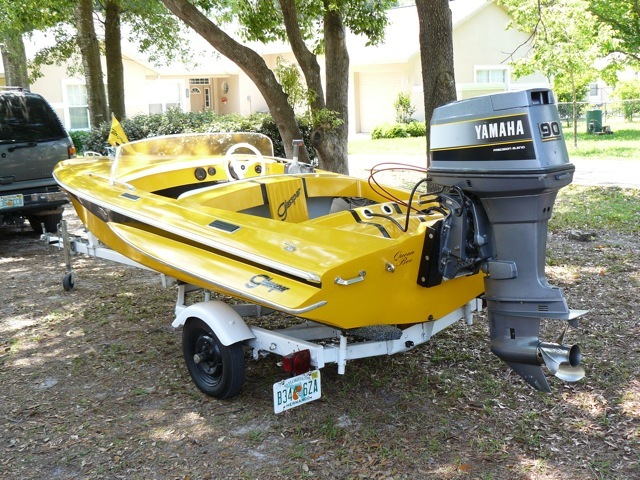 "originality" of the boat, motor and trailer at the classic boat shows but I also have a newer engine on it too. Altogether, it all works good for us. Your family did a wonderful job of preservation then. I wish the former owners of mine had shown her the same respect. I'll have to cut mine apart at the transom as they glassed over the seam when they redid it. The floors are gone but the glass is good. It's a blank canvas I almost wish I could give to a better artist but she's stuck with me. We reproduce vintage boat emblems in Sand Cast Brass. They will require chrome plating. I have G3 and Glasspar emblems in stock. Very nice and definitely food for thought ! Thanks ! Mark. Those sandcast reproductions look excellent Larry – nicely done. Mark, don't be too nervous about any fiberglass work, it is not difficult unless it is above your head! Planning, preparation and correct choice of tools & materials, splattered with patience and it is a doddle. There is a mass of good advice and tips on this site along with helpful enthusiasts who started on a project just like you. Haven't got a fear in the world. With the access to knowledge that's available here and on other forums ( I joined the G-3 club and registered the boat today ) I couldn't get it wrong without really trying. It's more budget than anything. I choose the Humber for this year as it may actually get wet where the G-3 can't be done that fast. I'm going to take my time and enjoy the heck out of it. It may take a year and change to rebuild it and find the powerplant I'm after but that's okay. I'm not fixin to croak just yet. LOL. Thanks for your help Ken. Looks like Glasspar lost the trademark (if they ever had one) on the name or designation G-3. Doing some research online I came across " www.G3boats.com " and found a complete line of fishing boats that are called G-3's now. Ours are definitely better. LOL. Amen!!! Here is pic of another great restored G-3 by Vernon Turner. Boat now owned by Pat Harris in South Carolina. It didn't post ? I sent some pictures of Dean Lofal's G-3 to my Brother-in-law and he has decided that he wants half of mine ! I'm good with that as he has restored dozens of boats and really knows his stuff when it comes to glass. Unlike myself. With his help I know we can do her justice. He's a pretty darn good home mechanic as well so whatever we end up with for power ( I'm torn between the Cloud White Kiekhaefers and that Black Phantom Anniversary model now ) will purr like a kitten at idle and roar like a lion at WOT. I can't wait for spring to get started on it! 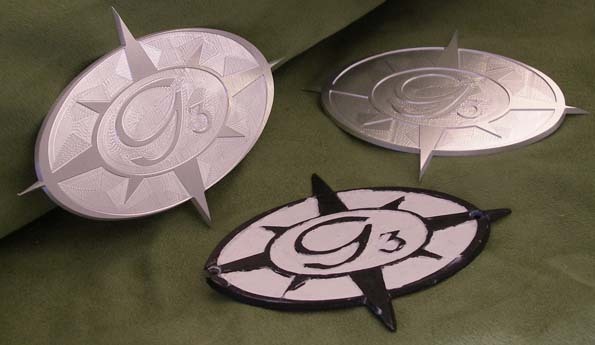 Do you still have G3 emblems?